The thing about these is that there really is no “strict” recipe. If you’re serving 10+ people this as a side dish, you’re going to need about 5 or 6 good sized potatoes. If you’re like me and only feed a couple of people, you’re only going to need a couple of potatoes. Below is a list of the ingredients I use, and how I prepare them. You’ll have to be the judge on how many potatoes you use, and it will be simple to adjust the recipe accordingly. Line a casserole dish with foil and set aside. Wash your potatoes and chop them into bite sized cubes. Place them in a large mixing bowl and add the vegenaise and margarine. Since there are no strict measurements for this recipe, basically you need to start with a few spoonfuls of vegenaise and 1 TBSP or so of margarine, and mix well until all of the potatoes are coated fully. Keep adding the vegenaise until all of the potatoes have a solid, but light coat. 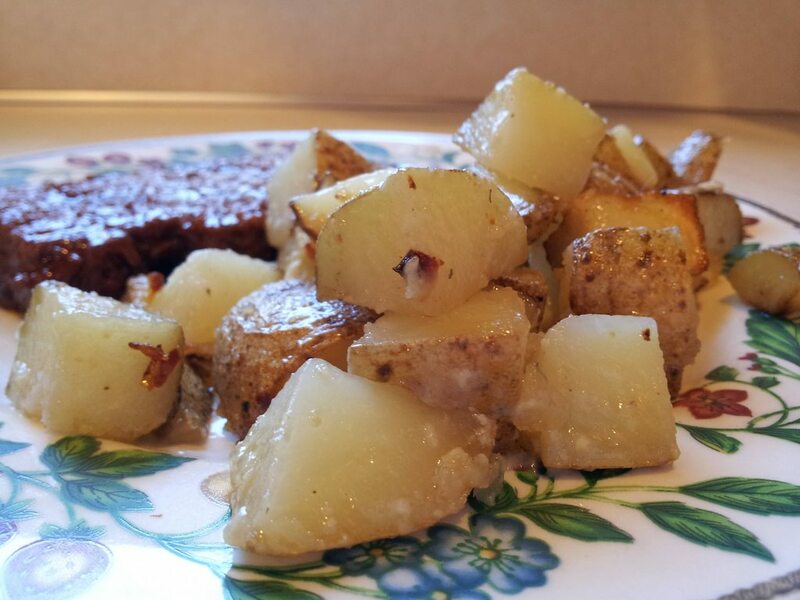 Evenly spread the potatoes into your prepared pan, and sprinkle with your seasonings, I usually coat mine heavily. You want your potatoes to be in a mostly single layer. If you have some over crowding, it’s fine, but mostly keep them in a single layer. Place them in the oven and bake for 30 minutes. After the time is up, remove and toss well, and place them back in the oven for 15 minutes. If you want them crispier, broil them on low for 4 or 5 minutes and serve. Hope you enjoy these as a side dish this holiday season!